Halloween is a fun holiday full of treats, costumes and spooky movies for both children and adults. 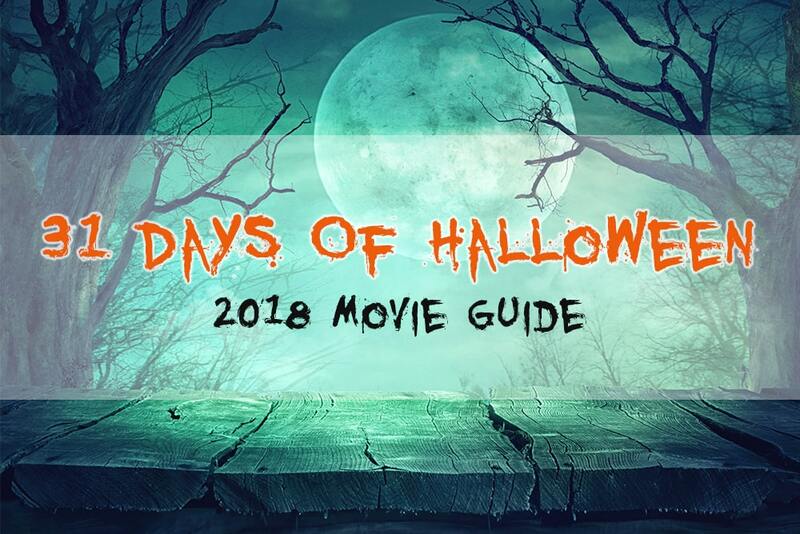 With so much fun activities for the holiday going on, check out our list of 31 Halloween movies to get you and the family in the spooky spirit! We’ve picked 31 movies, one for each day in October. In this list there’s something for everyone in the family to enjoy: classic horror, kid friendly Halloween fun, on the edge of your seat suspense, silly comedy and recently released horror movies. We’ve included rating and a short description to make sure not to scare the little ones. A team of scientists that just lost their jobs at a New York university are looking for a way to make a living and have fun. But once they become the Ghostbusters, they stumble upon a portal to the underworld. They soon realize they’re the only line of defense against New York and the supernatural. A boy, a magical cat and three ancient witches? What could go wrong? In this family friendly movie, watch as young Max embarks on his journey to steal the book of spells to prevent the witches from becoming everlasting. In this classic musical comedy/horror film, watch as lovebirds Brad and Janet find themselves stranded on a spooky night, discovering the house of a creepy scientist and his freak-show entourage. A dog is a boy’s best friend but when Victor’s dog sparky passes on, he’s heartbroken. As Victor struggles to go on, he devises a plan thanks to his science teacher to bring Sparky back but things do not go as he planned. With Halloween approaching, a young boy D.J. and his two friends set out to destroy the Nebbercracker house because D.J. knows it’s haunted. Even though his friends don’t believe him, they still embark on the adventure together only to find out that things get much, much worse for the neighborhood. A young ghost Casper who resides in a haunted mansion falls in love when a supernatural specialist and his daughter pay him a visit. Certainly, this is no typical relationship and Casper’s family have their own feelings about the relationship as well. When long lost uncle Fester comes to town, the Addam’s family is thrilled. But when a series of a few unfortunate events occur, they soon see they must do what it takes to protect the Addam’s family fortune. After the Maitland’s are laid to rest, they soon find themselves stuck haunting a house that was once their home. When new owner’s purchase the residents, the pair decide to try to haunt them out which only ends up creating unforeseen dangerous conditions for the new owners daughter. The new chick at school finds herself among three wannabe witches who just so happen to be looking to add another member. Each girl brings something to the table, but what they don’t know yet are just how truly powerful they all are together. George and Kathy finally found a gorgeous new home for the family but for some reason it seemed too good to be true. The family soon finds they were right as they learn the former resident gruesomely murdered his family in the home after becoming possessed by the devil. A girl and her friends set out to find the truth when she’s told her grandfather’s grave has been vandalized. While examining the damages, the group visits the family’s old estate only to find out they may never make it home alive. The Perrons and their daughters find a beautiful and isolated farmhouse that’s just perfect for the family. When strange happenings begin to occur around the home, they aren’t taken seriously but when the family finds out the dark truth about the property they now own, things begin to get horrifying. When a new couple moves across the country to a new house, they discover their newlywed problems are the least of their concerns. As their landlord grows increasingly interested in their personal lives they soon find out he’s been watching their every move since day one. In a future 2020, most of Earths inhabitance has been eradicated by mysterious creatures that attack when they hear sound. The Abbot family surviving on scavenged supplies, living alone amongst these creatures, learns if they have what it takes to keep going when the going gets rough. If they hear you, they hunt you. When an orphan has a couple grieving the loss of their unborn smiiten, they decide to adopt the orphan. Things quickly take a turn for the worst when the family realizes the child is not as innocent as she seems. In a crime-ridden city, a retiring detective and a new transfer take on one last case, they discover the murders of a serial killer. They determine the killer is targeting those he believes embody each of the seven deadly sins. When a young girl discovers an alternative world in her new home, she finds that it’s seemingly better than her reality but when her new friends and Other Mother want to keep her there forever, she knows she must do everything in her power to get herself back home where she belongs. A couple moves into a seemingly normal house in a suburban neighborhood but once they start to notice they aren’t the only two in the home they realize they’re living an anything but normal life. This film is based on the real events and trial of a young woman whose death was the result of an exorcism. A lawyer agreeing to represent the Reverend, who is being charged with the death of Emily Rose, helps bring forward truths behind Emily’s death that they never saw coming. Can dreams become reality? On Elm Street they do. When a series of murders in a Midwestern town that are seemingly impossible begin to occur, one girl decides to investigate. Will she have enough time to discover the truth before it’s too late? Chucky and Tiffany are back with a vengeance. When Chucky’s victim is put in a criminally insane asylum, he returns for her and to repay his enemies with a visit. After the murder of a teenage girls mother, she soon finds herself along with her friends, at the fate of a killer who uses horror films as a part of a fatal game. The game starts with phone calls and leads to death. A couple passing by a small town find themselves in trouble when trying to let the authorities know they found a boy dead on the side of the road by a corn field. They soon learn the town is inhabited only by children who are the followers of an evil reverend and must do what they can to get out of this town alive. The first stages of a relationship can make anyone nervous, even family. But over the course of a weekend, new beau Chris learns truths that will haunt him for the rest of his life. Do you have a worst nightmare? The seven kids in Derry, Maine are about to meet theirs. He’s Pennywise and he’s back with a vengeance terrorizing the bunch over one summer they will never forget. When Kate and Angie, two alienated sisters who hadn’t spoken in years come together for Angie’s bachelorette party in a show of reconciliation, they soon learn this trip may be their last. Prior to anyone’s knowledge, the girls booked a stay at a house they may never leave. In theaters on October 26. When an author and his family stay in an eerie hotel in isolation in hopes to rectify his writer’s block, things seriously start to go awry. They soon pay a fatal price when they learn the dark secrets of the hotel. A mother desperately searches for answers when her daughter begins acting strange. With no help from doctors, finally a Priest who believes she is haunted by the devil steps in to lend a helping hand only to end up getting much more than he bargained for. A young Anna finds her life as she once knew is turned upside down after being released from a psychiatric center. As the ghost of Anna’s mom appears one night hinting she was murdered, Anna and her sister take it upon themselves to discover the truth. In this strip of the Peanut comic series, the crew celebrates the holiday or Halloween and Linus awaits the Great Pumpkin. Halloweentown’s pumpkin king Jack Skellington grows bored with Halloweentown’s haunting tradition and when he stumbles upon Christmastown, Jack devises a plan to bring the new town to his very own control. Sooner rather than later, he realizes he’s in over his head and even the most thought-out plans can end badly. That’s it! What did you think of our list? Is there any movies we are forgetting or that you’d to see on our list for next year? Please leave your suggestions in the comments.